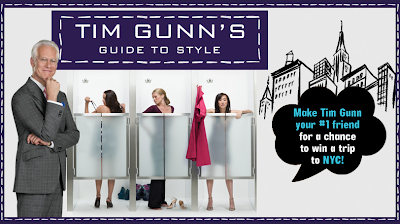 More about Tim Gunn's Guide to Style here at Popsugar. Here is an Elle.com interview with Nina Garcia. More Neeena from Time Out Chicago. Here is a slightly different perspective from the Gawker Book Club. 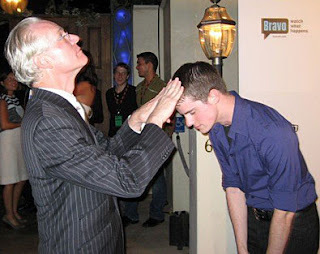 AfterElton.com has a great interview with Tim Gunn. Here is a feature about Tim and Veronica from BuddyTV. Here is an interview with Tim in the Chicago Sun-Times. 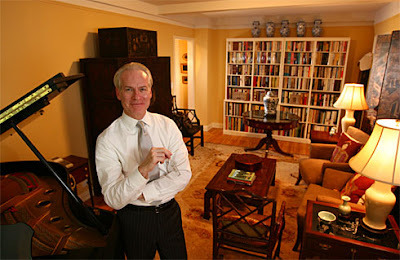 Click here for the USA TODAY article featuring the new apartment of Tim Gunn. Thanks Ellen. Now ... what would make the perfect housewarming gift for Tim? I'm going to suggest a bottle of Krug Grande Cuvée and Anderson Cooper. But I know something that the readers of Blogging Project Runway can give him - high ratings for 'Tim Gunn's Guide to Style.' Make it work, people! Make 'Tim Gunn' your number one friend on MySpace and become eligible for a trip to NYC and a consultation WITH TIM! Click here for the MySpace identity. And click here for the rules/details. Enter now - all the cool kids are doing it! It's one week until the premiere of 'Tim Gunn's Guide to Style' as well as the return of the Blogging Project Runway 'Party Post.' Mark your calendars for 10:00 p.m. Eastern on Thursday, September 6th and join us here at BPR to "watch what happens" and dish during the show with other Tim Gunn and Project Runway fans. Click here for AOL's charming interview with Tim. Thanks Zach. Here's a preview video of the show. And, don't forget, Houston! You can still see Tim tonight. Click here for the 411. Which Was Your Favorite Season of Project Runway? It's been a while since we did a poll. With all of these marathons on Bravo it's just natural to sort of compare one season to another. So, I was wondering: which season of Project Runway was your favorite? Click here to cast your vote. Zulema Griffin will be showing her Spring '08 line "Slave to the Rhythm" on September 12 from 6:00 - 10:00 the Rush Arts Gallery and Resource Center 526 West 26th Street, Suite 311 New York, N.Y. Click here for more information. Click here for a sneak peek at Mychael Knight's jewelry line. Robert Best has designed a "Go Red For Women" Barbie to benefit the American Heart Association. Click here for ordering info. Thanks Sharlene. Last, check out Jay McCarroll here On The Inside. Dedicated Project Runway fans will appreciate the Season One Marathon today on Bravo. Beginning at 9:00 a.m. with 'Innovation,' the first Emmy-nominated episode, and concluding with the 'The Runway' at 6:00 p.m. (all times are Eastern), our favorite network has only excluded the Reunion in this airing. Don't miss one of my personal favorite episodes, the Postal Uniform Challenge at 4:00 p.m.; this was my intro to Project Runway and, needless to say, I became a PR addict. Tim Gunn will be appearing at the Fashion Live! event at the downtown Macy's on Thursday night, August 30. Click here for more info and to purchase tickets. According to Heidi Klum's Website, Season Four will premiere on November 14th. Thanks Curtis. Watch the new season of Project Runway beginning Wednesday, November 14th, only on Bravo (check your local listings). I consider it to be our best season yet!" Project Runway Season Three winner Jeffrey Sebelia has designed this blazer for Blake Sennett of the band Rilo Kiley. It appears on the cover of the latest issue of Spin magazine! Thanks Karen. Although I have read many articles and interviews about Tim Gunn somehow I have managed to miss any reference to his salary at Liz Claiborne. This one reveals it. Hmmmmmm..... Somehow I am very skeptical of that number. UPDATE: My Wall Street expert checked the 2007 proxy statement for Liz Claiborne and noted that the CEO of the company makes $900,000. It is highly unlikely that Tim makes the amount quoted in the article. Speaking of Tim, he is still on the schedule for an appearance on September 30th at the Baltimore Book Festival. Our friends at Buddy TV have a great feature about Nina Garcia and her new book. Here is an article about the Seattle "La Mode" event with Nick Verreos and Andrae Gonzalo. Nick Verreos and Andrae Gonzalo will be at the IADA Campus for a Fashion Show and Charity Auction. Click here for more info and to RSVP. Of course, we would love to have a BPR Field Reporter! Don't miss "Project Jay" followed by a Season Three Marathon today on Bravo. On Thursday, September 6th, 2007 at 12:30pm, Alison Kelly will set off the Nolcha runway unveiling her highly anticipated Dahl by Alison Kelly spring ‘08 collection to an audience of fashion elite and international press. Dahl by Alison Kelly spring ’08 collection takes an upbeat approach while staying true to its signature fierce, yet romantic quality her line has embodied with her previous collection. Using colors such as red vermillion and buttery yellow, her new collection offers an array of elegant, yet playful ensembles that seamlessly fold and flow across the body. “I dreamt of China in 1920, there was a woman sitting next to an elegantly dressed gentleman in an old Rolls Royce, she was the image of beauty, wearing a beautiful gown of sage green, jewels & lacquered hair. Her eminence comes to life in this collection.” says Alison. For additional information on Nolcha Fashion Week: NYC and Silhouette please contact Christie Pageler: cris@pagelerpr.com or 786.303.9774. Laura Bennett will show several designs at the MetLife "Snoopy in Fashion" Show at Bryant Park on September 7th at 6:00 PM. Read more about it here on Project Rungay. Malan Breton will be showing his collection on September 12 at 1:00 at the Metropolitan Pavilion - North. 110 W 19th Street. 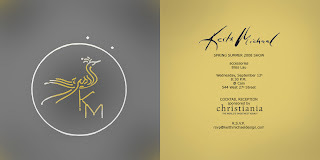 Keith Michael will be showing his designs on September 12th at 8:30 PM at Cain. 544 W 27th Street. All of these shows require tickets or RSVPs in order to "get on the list." If you are able to attend, please let us know - we would love to have field reporters. NEW YORK, Aug. 21 /PRNewswire/ -- The Weinstein Company is pleased to announce that they have completed five multi-year licensing agreements with category partners to coincide with the airing of the fourth season of the Emmy-nominated hit fashion design competition series, PROJECT RUNWAY. Don't you think Zulema should be included in the marketing for those scissors? Don't miss the interview with Conchita and Raquel! On Friday morning Kaitlin wanted to take a dance class here, so Roz and I dropped her off and went shopping. Meanwhile Nick called to thank us for coming to the show. A little later David called to invite us to a family barbecue at his his mom's house! Of course we were delighted to say yes. Hee! David was raised in San Diego and his mom still lives in the same house. After an afternoon at the zoo, we headed to Conchita's for the party. We enjoyed a delicious meal of traditional Mexican food - meat freshly grilled by our host Chris. We described our favorite outfits and our favorite moments from the previous evening's show. From left to right are Rita with Casia, David's sister Marisa with her daughters Samantha and Emilie, Marisa's husband Tommy, David, Me, David's stepdad Chris (a little shy) Nick, David's mom (and our hostess) Conchita, Nick's mom Raquel and his dad Jim, David's sister Elise and her daughter Katie. In the chair is Rita's son Alain who very dramatically lost a tooth that evening in a Snicker bar. On behalf of all of us at BPR, I would like to thank Nick and David for inviting us to the show and to Conchita for including us in her celebration. We had a fabulous time. On a personal note, it was wonderful to meet Roz. She took most of the photos in these posts and I now consider her a precious sister. This event has been a perfect reminder that BPR is a community of the friends of Project Runway. After the show we ran into Raymundo Baltazar. He is adorable and very busy - he promised to update us. We also ran into Amanda Fields. I asked for her autograph. She is very busy modeling AND acting. Her top is a NIKOLAKI design and her necklace is Heidi Klum! Nick was busy tending bar and David was greeting everyone in the crowd. It was really fun, but I was getting tired. We said goodnight to our new best friend Roz - and went up to our room. The next day would contain a wonderful surprise! The show was over, but not the party! I loved this dress - of course Amanda looked beautiful in it! These two gowns seemed to be the audience favorites. There were lots of cheers and applause for the show, but these got the biggest reactions. Especially the first one. It was a true Showstopper. Click here to see the rest of the designs. As we were waiting for dusk and for the show to begin we were offered complimentary wine. There was a cash bar as well. The journalists were out in full force interviewing and taking photos. Several approached us. Whenever I admitted I was a "Blogger" I felt like they might just turn away or say "Uh, never mind...." but they didn't. I truly believe that Bloggers are gaining respect - yay! The NIKOLAKI logo was projected onto the side of the hotel. As it grew darker the logo became more prominent. Roz took all of these photos - thanks again, Roz! At last Leah announced that the show was about to begin! The first look came down the runway - do you recognize this model? When I learned that the NIKOLAKI Spring 2008 Show was going to be in San Diego I realized that I could go! It is only a six-hour drive and Kaitlin is always willing to be my traveling buddy. Off we went to the W Hotel in San Diego last Thursday. We arrived in the afternoon where we met Roz, our fellow BPR and Field Reporter. It is always fun to meet members of the BPR community and Roz would prove to be indispensable to our team. Meanwhile, Nick and David were backstage getting everything ready. Nick's niece Casia was just adorable! Don't you just love her outfit? Nick's mom Raquel and a friend of hers from San Antonio made it and surprised them backstage! The runway shots and the backstage shots are by Evans Ward. Click here to watch Nick Verreos on San Diego's Fox 6 Morning News Show. Click here to watch him on "Inside San Diego." Chloe Dao never sits still, does she? 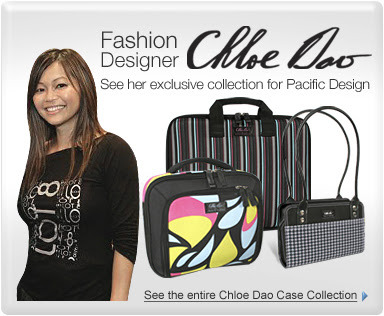 Pacific Design is introducing a line of "technology bags" designed by Chloe. Click on the photo to see them all. The Jay McCarroll podcast is now posted at Fred Flare. Like everything at Fred Flare, it's really cute! Listen to a radio interview with Nick Verreos here. 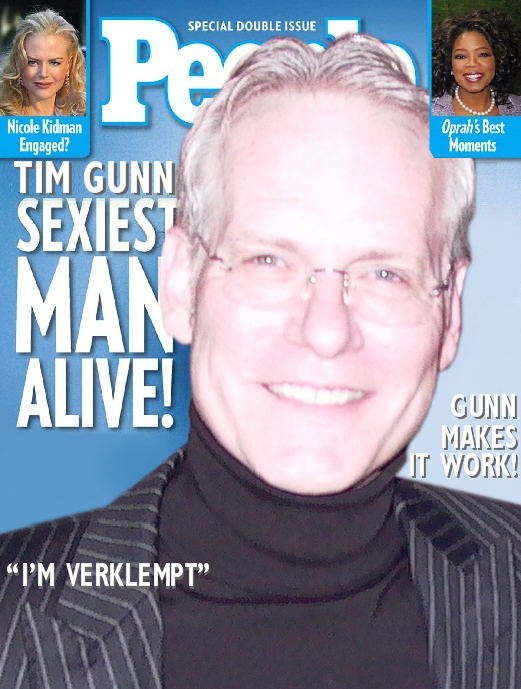 Thanks to everyone who is sending links and scans to the OUT Magazine article featuring Tim Gunn and the designers. The PRGayboys covered the article with their wonderful insights here. Enjoy this if you haven't already! There is a special deal in this months issue of Lucky Magazine. Thought I would share the love with the BPRs. Thanks Doll. How is the wee babe? sooo cute and red and gorgeous, and I cannot wait to meet this lil tyke. Just two more days until the Nick Verreos Show at the W Hotel in San Diego. After the fashions, Nick will serve as a "Celebrity Bartender." Sounds like fun! My daughter and I are driving over from Scottsdale and we'd love to have you join us. Don't be shy. If you're a big fan of Heidi Klum (and aren't we all? ), you simply must pick up the September issue of Town & Country. Heidi is at her stunningly beautiful best clad in gowns by Dior (as on the cover) as well as other designers while she sparkles more than the gems she wears. This future face of Jordache (check their site on August 15th) reveals that she possesses business sense to accompany her fashion savvy. (When Klum was on QVC selling her jewelry, "...fourteen of the sixteen styles sold out in thirty-six minutes.") And of course Project Runway gets mentioned as does Michael Kors. Click here to read the article but you'll have to buy the issue to see the other beautiful images of Heidi. Click here to visit Style.com's Fall Shopping Guide. 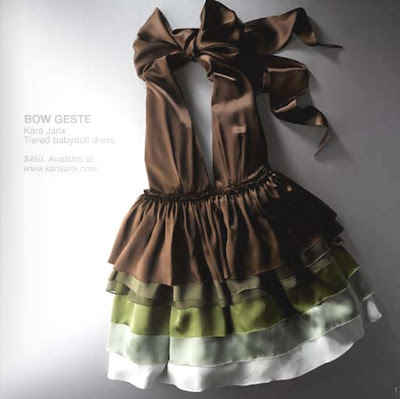 Kara's dress is item number 17! Click here to buy. The super-sized September issue of Elle magazine contains this story about Nina Garcia. Thanks CJB. Click here for a nice interview with Nick Verreos in Alive Magazine. Thanks Moira. Nick will be hosting the "Forbidden Fashion" Show at St. Louis Fashion Week on August 23rd. The Project Runway Season Three DVD will be available on November 6th according to Amazon.com. It is not yet available for pre-order; in the meantime if you still need the Season Two DVD it is only $17.99. Click here to order. ETA: The video was removed by the user. Click here for the next venture of Jay McCarroll. Yes, he too is one of the Project Runway success stories. He has a wicked sense of humor to go with his mad skillz and it seems he is enjoying pulling the 100% organic wool over the eyes of NY Mag. 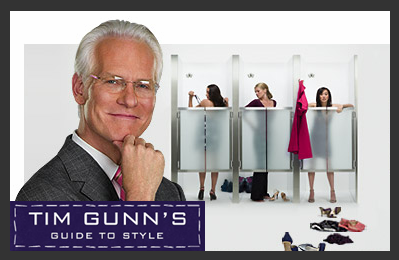 Click here to see the new site for Tim Gunn's Guide to Style. I love how the first "Success Story" he mentions is Emmett McCarthy! Nina Garcia has written a book, The Little Black Book of Style - take this opportunity to pre-order it right here at BPR before it goes on sale September 4th. And yes, there will be a book tour for the always popular Project Runway judge and fashion director of Elle Magazine - click here for the schedule. Thanks, Bonnie. The September issue of Details Magazine (on sale in LA and NYC today and nationwide August 14th) features Follow the Rules: Michael Kors. Thanks, Carson. Finally, the Spring 2008 Mercedes-Benz Fashion Week schedule is up today featuring designers that have served as judges for the past three seasons of Project Runway including Michael Kors on September 9th at 1:00 p.m. You can also see fashions from the fabulously glamorous Season 3 alum Laura Bennet in the 'Snoopy in Fashion' runway presentation in 'The Tent' on Friday, September 7th at 6:00 p.m. Thanks, Liz. Click Here to Visit "Atelier Dahl"